As we retooled the Weekly Drawing Project during our ( me, Shirle Bedient, Ronnie Offen) annual week on Amelia Island, we added a labelling component, and also came up with a list of “challenges” as a way of further expanding our explorations. At this point, there are 19 challenges on the list, and we are each to tackle any 12 of them at any time during the coming year. This is my current favorite quote….absolutely right on. I have it mounted on my drawing table, and read through it every day before I begin working. “I don’t go to the studio with the idea of “saying” something. This past week-end I taught a 2-day workshop about my process of making (building) acrylic/collage paintings. As my process is to work layer upon layer, which, of course requires drying (and thinking) time, it doesn’t work to demonstrate making a painting straight through, start to finish. It was necessary to both bring a variety of starts and demonstrate starts, second steps, third steps, etc. etc. 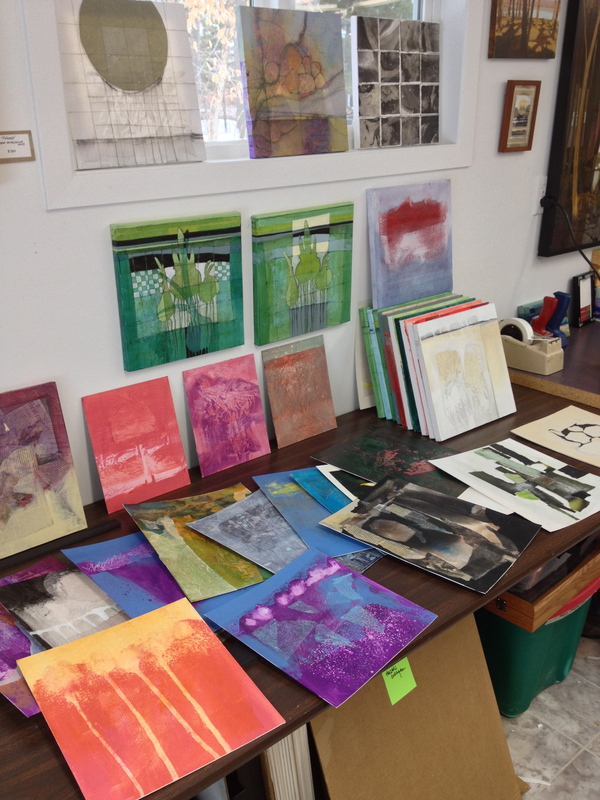 So now I have 34 new small (12″X12″ and 11″X14″) paintings going, all in various stages of completion. I could hardly wait to get my workshop tubs unloaded so I could start painting. I have added a new collection of pages entitled Making Better Art, where I am beginning to assemble my vast accumulation of random thoughts on the topic into some sort of coherent order. Ann Patchett, as her character Dr. Annick Swenson in STATE OF WONDER. The character is actually referring to scientific research with this statement, but the idea is 100% applicable to making art, not only those who do intuitive/experimental art, but to all artists.